There are a lot of feel-good Instagram accounts out there, reposting sun-soaked shots of ladies getting after it in the outdoors. Ladies Shred Society is more than just feel-good goals, though. It’s a group of women brought together by founders Michaela Eichenbaum and Giulia Bacci, who link up for an epic weekend of riding in the mountains and the sea. 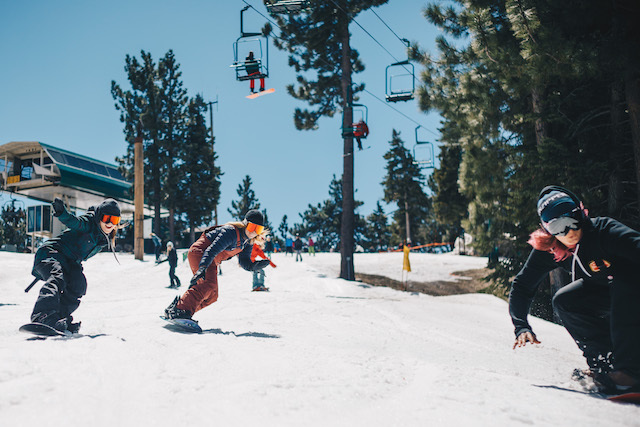 Eichenbaum and Bacci, both board-sport enthusiasts, felt there weren’t adequate spaces within the snowboard, ski, and surf community for women to connect with each other and that existing women’s ride days lacked a sense of camaraderie—and were too brand-focused. So, last year they brought together sixteen women for riding, surfing, yoga, and a host of other activities for the first Ladies’ Shred Society event. This year, Ladies’ Shred Society more than tripled in size, with Ladies’ Shred Society hosting 50 women for a three-day event. We caught up with the founders to learn more about their efforts to bring women together in the outdoors.